Turn big-picture strategy and goals into action and results with this company goals and milestones template. The best-run businesses set clear goals that provide direction and a shared sense of purpose for their team. Your company’s goals and objectives this year might be, for example, “Generate $10M in revenue,” “Increase customer satisfaction by 25%“ or “Grow headcount by 5%.” But without a way to connect your high-level goals to the day-to-day work being done, it’s easy to lose sight of goals and become misaligned. Fortunately, Asana can help. Use our template for goal planning, visualizing progress, and tracking all your objectives and key results in one place. Connect strategy to tactics. Break down goals into projects and tasks so everyone knows how their daily work ladders up to the bigger picture. Nail your execution plan. Give each goal or objective a clear owner and due date for to drive action and accountability. Track your progress. Once work is kicked off, share team updates so everyone knows how you’re progressing towards goals and where there are blockers. Try out six tips for turning big goals into action from the planning experts at Asana. The major manufacturer implemented its workplace of the future with Asana. Need a new planning framework? Get clarity around purpose, plan, and responsibility to help you hit goals. Go beyond just listing your company goals and objectives to track real progress towards them. 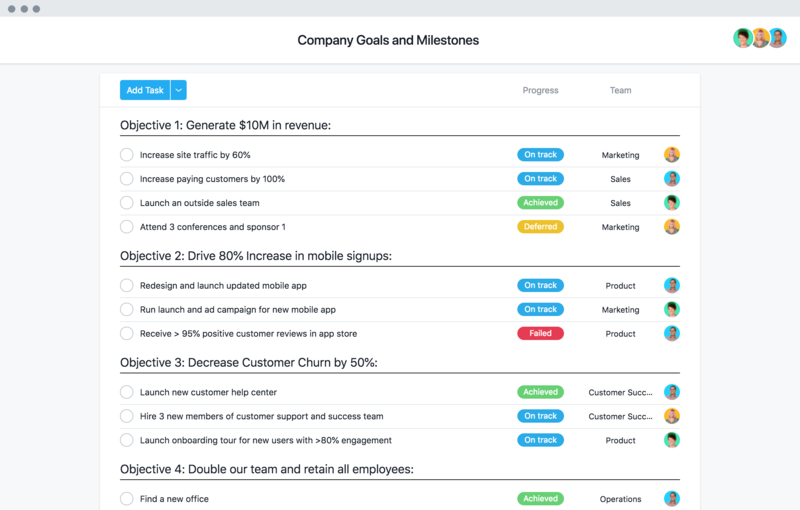 Get our company goals and milestones template with a free trial of Asana Premium today.